Do I give up my dream to train horses? Family or business? Hobby or dream? 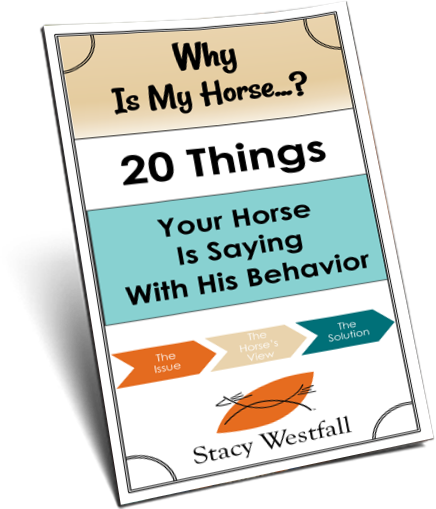 “Stacy-Horses have been a passion of mine from as long as I can remember, but unfortunately I never had the opportunity to interact with them until a little less than a year ago. A little less than a year ago I started working for an equestrian center just cleaning stalls on top of my full-time job that I work 2nd shift in. I was fortunate enough to meet the trainer that comes to the barn to break out the horses there. He was nice enough to allow me to shadow him with shoeing and training and also to taught me how to ride, started me in barrels. With doing all of those things as you can imagine my passion grew much larger and it took up a lot more of my time. This is where I need your motherly advice. I have a fiancé and a 3 year old daughter whom I wouldn’t trade anything in the world for, but she and I have not been seeing eye to eye with my passion. She thinks its just a hobby and it takes way to much of my time. Choices, choices….life is full of choices and each one helps determine our path in life. I cannot tell you what to do but I can tell you what I have done and share a bit with you how I think. It is exciting that you have now found the opportunity to express a passion you have had for such a long time. I love learning and when combined with passion….it can light a person on fire. I think I can feel your excitement coming through the computer! Do keep in mind that in most things there is a ‘honeymoon’ period and you are still in that period with the horses. This feeling can also be magnified if you are unhappy with your current job as it will make this ‘new job’ look even more appealing…magnifying the honeymoon period and intensifying the feelings. Stacy Westfall showing in western pleasure early in horse training career. • Does the time and effort put into the activity indicate an intention to make a profit? • Does the taxpayer depend on income from the activity? • Has the taxpayer changed methods of operation to improve profitability? • Does the taxpayer or his/her advisors have the knowledge needed to carry on the activity as a successful business? • Has the taxpayer made a profit in similar activities in the past? • Does the activity make a profit in some years? Most people in a start up phase will allow for great leeway in the name of learning. Things will go faster and smoother, both financially and with your fiancé, if you take the time to write out a plan for how- and when- this is going to turn into a business. I highly recommend that you check out the website for Dan Miller and 48 Days to the Work You Love. Listen to the podcasts, read everything he has. It would be my guess that the faster path to income will be in the farrier work, depending on your area, so maybe start the business around that idea. You state that your ultimate goal is to be a great farrier and an even better trainer. I believe that you were referring to your business goals here but I will challenge you to think bigger. My fastest path to my ‘ultimate goal’ is to imagine lying on my death bed. 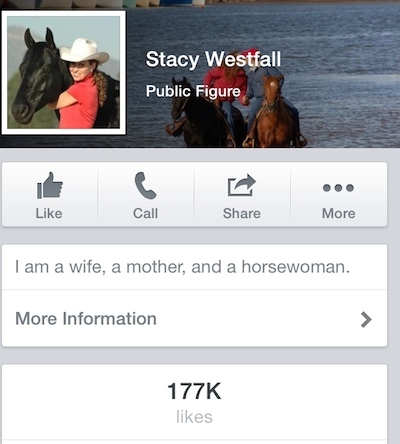 Stacy Westfall priority list as seen on Facebook; wife, mother, horsewoman. Instantly, life shifts into a different perspective. It is not an accident that my Facebook page says, “I am a wife, a mother, and a horsewoman.”…in that order. I could be busier than I am in my business; I could do more expos, clinics and other appearances, but I don’t. Right now that is a choice I am making because my kids are 12, 14 and 15 years old. They won’t always live with me. I can see this stage of life and I know it will likely come to a close when they graduate from high school. I choose to make the most of the time I have with them even if it isn’t the best decision for growing my business. I am not suggesting that this is an either/or choice. I am stubborn enough to think that people can have both family and business success…as long as they decide ahead of time what both of those look like. There are many people out there with more wisdom on this subject, Dan Miller included, that can teach you about finding that balance. Early on in our business our life wasn’t balanced but Jesse and I were on the same page. For the first two years out of college we worked full time jobs, had children, and trained on the side. By definition it was a hobby. Three years into our marriage we filed taxes on the new business and during the next four years Jesse worked a full time job AND rode horses…enough that it was a second full time job. I had our third child, was a full time mom and horse trainer, stall cleaner, lawn mower…you get the picture. 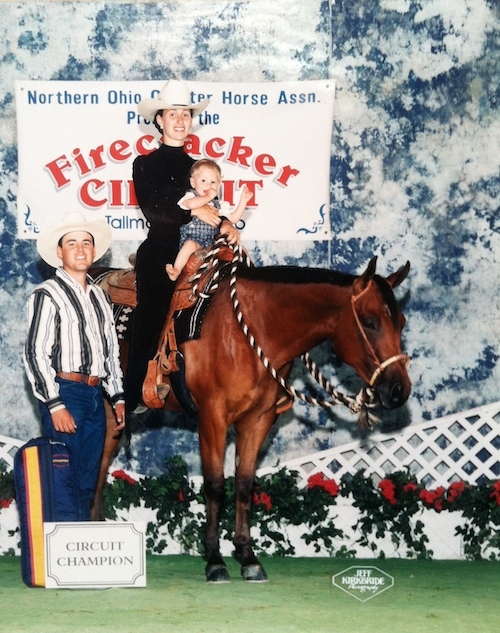 Jesse Westfall was Congress Reserve Champion the same day his youngest son was born. It took six years of hard work before the horses became our only business. During that time our income was below or just at the federal poverty line. For me personally, I had to look directly at the situation and decide that if push came to shove and I had to choose- I choose family. This was first published March 3, 2014. After publishing almost 1000 posts, I find it interesting to ‘search’ my own site and read what I have written years ago. Some of the posts ‘expire’ because they were about a time sensitive subject, but others, such as this post, are as true to me today as the day I wrote it. From the outside, someone looking in on my business activities would not always see the pattern in my choices. That would be most likely caused by the outsider applying a different set of rules, ideals, time tables, or measurements of ‘success’. The important thing is that those close to me: family, advisors, and friends can look and see that what I am doing fits my long term goals. It takes an ‘insider’ to help keep you on track. This is why I’m so excited to finally be moving forward in my own business as a career coach. I know I have valuable information about my industry and I want to share it with those who are looking for an advisor. The Equine Career Conference is one way that people can access my advice…and I’m planning to set up more access in the future! I just read this post for the first time. WOW. This sure gives me plenty to think about. Choices are hard, and I am like you–stubborn enough to believe that I can have both a family and a career in horses! I still haven’t figured out HOW to go about that yet. But this gave me plenty to think about. I am now more inspired to set goals–nothing does that quite like picturing yourself lying on your deathbed, as you mentioned. THANK YOU for writing this! Stacy, I like you more and more with every post! Stacy, your response is amazing and right on. Awesome advice! For balance in my life if look to faith first (whatever that faith may be), family second and career third. When priorities are in order everything comes together and life balances. I seriously did not think you’re advice would have went that way, Stacy. I first thought after reading what He said, that I could not happily marry someone who could not see my Passion for horses as a career one day. Now what I never truly thought about, is yes, in the beginning it’s a ‘hobby’, now I say this in quotations only because it NEEEDS to start somewhere, to get anywhere, so as it may be a hobby now, it’s preparing you to build into a business. For example I want to own a rescue one day. 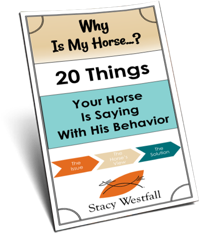 I do NOT know everything about horses, or even enough to make a rescue profitable, or even keep my head above water. So, I like the idea of keeping ‘hobby’ in quotations, because a passionate horse lover, has the will power to make it a business/career. I just re-read this blog…and still in awe of your ability to say just the right words to people you don’t even know…… BUT…..did I read that right??? under the photo??? 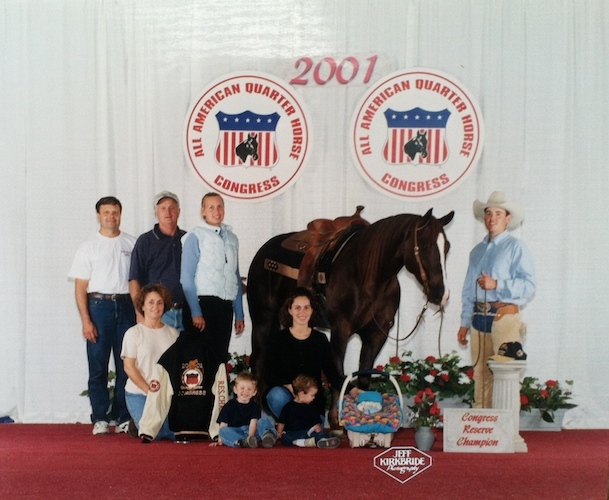 (Jesse Westfall was Congress Reserve Champion the same day his youngest son was born) ??? ….so you left there and had your baby?? just Add another “notch” in your hat!!! WOW!!! This is another fine example of Stacy’s generosity. One thing that stands out here is, Stacy and Jesse share the same passion. This is such an awesome post, Stacy. I believe that you have your life priorities aligned, and provided great advice and guidance. Kudos to you and your family for the hard work and dedication to achieve success and raise a family. God bless! wonderful work in answering that question. When I first started this I thought, OK, she’s a trainer — not Dear Abby. But apparently you wear many hats. Awesome advice!